Alamosaurus was a massive plant-eater (herbivore) that lived in the late Cretaceous period, between about 70 and 65 million years ago, in North America - in the region that is today the southwestern part of the United States. Alamosaurus was usually around 69 feet (21 meters) long, and probably weighed around 33 tons. The first fossils of Alamosaurus were found by Charles W. Gilmore in 1922. He found a pelvic bone ("ischium") and a shoulder bone ("scapula"). Later in 1946, Gilmore discovered further fossils, including a complete tail, a nearly complete right forelimb, and both pelvic bones ("ischia"). Various other Alamosaurus fossils have also subsequently been found in the southwestern US, but no skull material (other than a few teeth) have yet been found. North American Dinosaurs - Alamosaurus lived in North America, Many fossils have been found in what is today the Southwestern United States. Alamosaurus was a genus of dinosaur. "Alamosaurus" means "Alamo lizard" ("Alamo" refers to the Ojo Alamo Formation, the former name of a geological formation (today known as the "Kirtland Shale") in New Mexico, and does not refer to The Alamo in Texas). The name was chosen by Charles W. Gilmore in 1922. Alamosaurus was a member of the Saurischia ("lizard-hipped") order of dinosaurs. What this means, is that although Alamosaurus was not closely related to lizards, it did have similarly shaped pelvic bones. Alamosaurus was a Sauropod - a member of a group of related large quadrupedal herbivorous (plant-eating) dinosaur with long necks. Alamosaurus lived between about 70 million years ago and 65 million years ago, during the late Cretaceous period. Alamosaurus was one of the dinosaurs which died out during the Cretaceous-Tertiary mass extinction at the end of the Mesozoic Era. 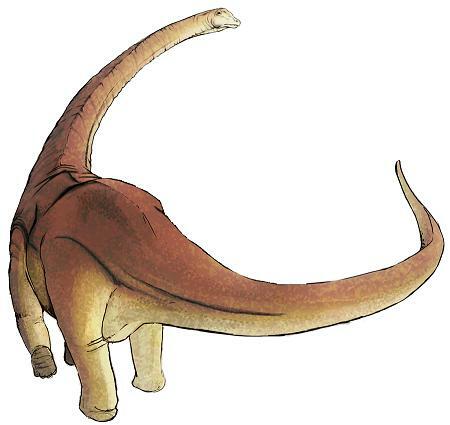 Alamosaurus was a herbivore (plant-eater). CollectA's collectible replica of the long-necked Alamosaurus is super detailed, down to the texture of its scaly hide. Specimens of this plant-eating dinosaur takes its name from the Ojo Alamo Formation in New Mexico, where the first specimens were found. The Alamosaurus was a sauropod that lived in the late Cretaceous Period about 70 million years ago. Very few fossilized fragments have been found, but the individual vertebrae are estimated at 1,000 pounds each. This figure from our Prehistoric Life Collection measures 8.1''L x 5.3''H. Each figure in our Prehistoric Life Collection has been approved by archeologist Anthony Beeson, a well-respected expert in paleoimagery. All CollectA models are individually hand crafted to the highest standards and made with the finest and safest phthalate-free, lead-free materials. Create a natural world in miniature with high quality toy replicas from CollectA. Our mission is to educate collectors and to provide the greatest opportunity for creative play. 秊 Safe & Soft: Made of soft PVC eco-friendly materials, odorless and non toxic, drop-resistant, safe and durable for kids to play with. Stuffed with PP cotton,the alamosaurus figure body is squeezable that won't hurt kids. You can twist the horn, the toe and play it roughly without worry! Kids' safety always comes first. ASTM/EN71/CPSIA/CE certification approved. 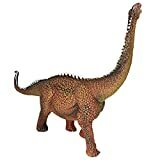 秊 Portable Size: Alamosaurus long neck beast replica 1:45 Scale. This hand painted dinosaur toy measures about 14.8"L*4.9"H (37.5cm*12.5cm). Weight: 400G. Suit for Age 3+. It can be great Birthday, Easter or Christmas gift for both children and adults. To dinosaur fancier collector this dinosaur would be a special display model, also great decoration in the room or office. 秊 Extra 6 Months Warranty by RECUR: 100% brand new and worry free purchase. If you had any problem with our products, just contact with us via Amazon message, we'll serve you till satisfied. We're direct manufacturer that narrows the distance between customers and factory. Our products include 4 series, prehistoric dinosaur animals, marine creatures, wild and farm animals. Welcome to our store for more exploration! RECUR---Know the world better by having it! We has developed 4 series of more than 100 products: Dinosaurs, Wild Animals, Sea Animals and Farm Animals. Just imagine hours of fun playing with realistic ancient animals designed especially for your unique collection. Are you ready for the prehistoric adventure? Get ready your dinosaur sets Now! ☺Enhances kid's hand-eye coordination, operational ability, shape and color recognition. ☺Bring new idea and possibilities for playground, collections or display shelves. ☺Great educational presents for boys and girls birthdays and party favors. Please Notice:1. This toy is not suitable for children under 3 years of age. Cannot be chew toys.  If you have any problem, please feel free to contact us! We believe great communication can solve all problem and make you satisfied. Help Your Kids Explore The Fascinating Dinosaur Universe! Are you on the lookout for an unforgettable birthday, Christmas, holiday or impulse gift for your little angel? Tired with flimsy dinosaur sets that fall apart in a breeze or threaten your kid's health with their toxic materials? 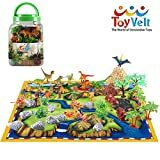 At Toyvelt we have released the ultimate set of 50 realistic dinos together with their environment details that will thrill your kids, encouraging their creative play! Treat Your Kid To A Premium Learning Toy! Boost your kids' imagination and help them develop their learning skills through an unforgettable trip to the world of adorable dinosaurs! Encourage them to socialize, joining efforts with their peers over creating a breath-taking setting for dino hunting, chase and countless adventures that will keep them excited long hours! Realistic To The Slightest Details! Hand-painted in vibrant colors, walking and moving their jaws, joints and tails, realistic T-Rex, Triceratops and a whole collection of different types of dinosaurs are just irresistible! Coming with the inspiring setting of the trees and rocks, dino egg props PLUS an exploration map, these large dinosaur action figures set is all your kid can ask for long happy play! Everything your little paleontologist needs is included in the package, in sizes and shapes perfectly suitable for his little hands! This dino play set stands out for its durability, which makes it the #1 educational toy throughout your kid's first learning years! Offer it to your kid, nephew, niece, grandchild or pupil and put a wide smile on their face! SAFETY: Our wall decals are 100% safe for children of all ages, easily peel, stick, remove, and redecorate in seconds. Even the kids can help! FAST SHIPPING: Made in USA. Ships within 1-2 business days, delivery in 2-3 days. 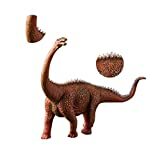 *** 12" Alamosaurus Dinosaur Removable Wall Decal*** All StickitGraphix Wall Decals are made in the USA using high quality materials. The decals are printed on an adhesive vinyl fabric that will not damage your walls, nor will it leave behind the sticky residue that other products produce. The wall decals are easily removable and reusable. (See instruction sheet included with every purchase). **YOUR PURCHASE INCLUDES**: Vinyl decal with step by step application instructions. Fast Shipping in safe package tube. 60 Day warranty if item is defective. For best results when applying your wall decals: follow instruction sheet included with purchase. **SHIPPING** We ship all orders within 1-2 days. You will receive tracking information when it is shipped so you can track its arrival. *** 36" Alamosaurus Dinosaur Removable Wall Decal*** All StickitGraphix Wall Decals are made in the USA using high quality materials. The decals are printed on an adhesive vinyl fabric that will not damage your walls, nor will it leave behind the sticky residue that other products produce. The wall decals are easily removable and reusable. (See instruction sheet included with every purchase). **YOUR PURCHASE INCLUDES**: Vinyl decal with step by step application instructions. Fast Shipping in safe package tube. 60 Day warranty if item is defective. For best results when applying your wall decals: follow instruction sheet included with purchase. **SHIPPING** We ship all orders within 1-2 days. You will receive tracking information when it is shipped so you can track its arrival. 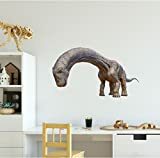 *** 48" Alamosaurus Dinosaur Removable Wall Decal*** All StickitGraphix Wall Decals are made in the USA using high quality materials. The decals are printed on an adhesive vinyl fabric that will not damage your walls, nor will it leave behind the sticky residue that other products produce. The wall decals are easily removable and reusable. (See instruction sheet included with every purchase). **YOUR PURCHASE INCLUDES**: Vinyl decal with step by step application instructions. Fast Shipping in safe package tube. 60 Day warranty if item is defective. For best results when applying your wall decals: follow instruction sheet included with purchase. **SHIPPING** We ship all orders within 1-2 days. You will receive tracking information when it is shipped so you can track its arrival. 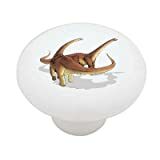 *** 24" Alamosaurus Dinosaur Removable Wall Decal*** All StickitGraphix Wall Decals are made in the USA using high quality materials. The decals are printed on an adhesive vinyl fabric that will not damage your walls, nor will it leave behind the sticky residue that other products produce. The wall decals are easily removable and reusable. (See instruction sheet included with every purchase). **YOUR PURCHASE INCLUDES**: Vinyl decal with step by step application instructions. Fast Shipping in safe package tube. 60 Day warranty if item is defective. For best results when applying your wall decals: follow instruction sheet included with purchase. **SHIPPING** We ship all orders within 1-2 days. You will receive tracking information when it is shipped so you can track its arrival.